Are you a keen follower of politics? Not sure who the contenders are or who to vote for? Meet the Candidate is an opportunity to get involved in the federal election, meet some of the dynamic candidates who are running and get all the information you need to make your vote count. 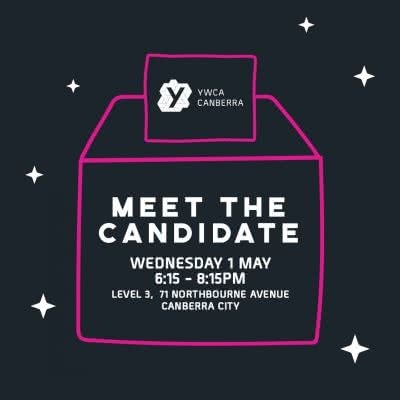 YWCA Canberra has a strong history of holding Meet the Candidate events. They allow members and guests to engage meaningfully in political discussion and network with emerging community leaders across the political spectrum. Attendees can hear directly from candidates and ask any questions they may have. Meet the Candidate events are free, child friendly, and informal. Light catering will be made available for this event. Confirm your place in the ticket selection box by Monday 29 April, noting any dietary requirements.